Visit magnificent Notre Dame Cathedral. See Monet’s paintings at Paris’s Musée d’Orsay, then discover his inspiration at the artist’s garden in Giverny. Trace the footsteps of Jeanne d’Arc in Rouen. Walk hallowed ground at the American Military Cemetery and World War II beaches of Normandy. Savor Normandy cuisine, and visit a working farm where these delicacies are produced. This 8-day cruise celebrates history, art, food, customs and all things Français in the country’s most dazzling urbane and pastoral settings. Arrive in Paris, romance capital of the world. Transfer from the Charles de Gaulle airport in Paris to your ship. * After boarding, take free time to explore Paris, or join our “welcome walk” to stretch your legs and get oriented. Wake up to a full day in Paris. After breakfast, embark on a half-day tour of this dazzling city and take in its most remarkable sights, including the iconic Eiffel Tower. 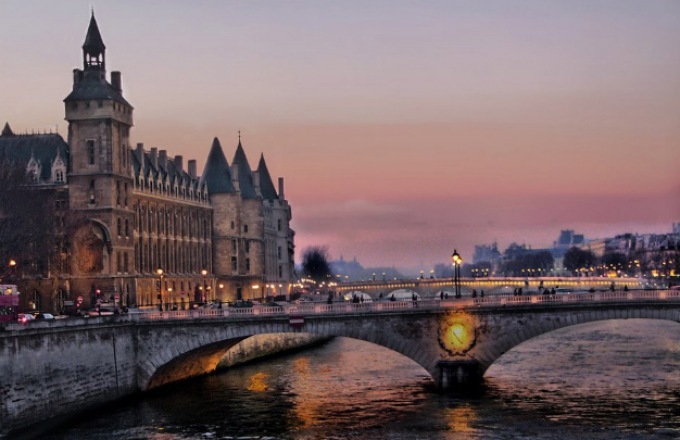 You'll also see the École Militaire, Orsay Museum and Latin Quarter and the magnificent Cathedral of Notre Dame. Then we'll drive past the Louvre and Opera House and along the famed Champs-Élysées. Return aboard for lunch. This afternoon you're free to take in the Louvre, shop the fashionable boutiques, visit the artists’ district of Montmartre or enjoy a cruise along the Seine. As always, your Program Director can help you plan your free time. Dinner is served aboard your ship. Arrive in Vernon before breakfast; take a short ride into the town of Giverny, where Claude Monet resided from 1883 until his death in 1926. Visit the beautiful gardens and charming stone farmhouse where he lived and worked; see the water garden with the recognizable Japanese bridge, water lilies, wisteria and azaleas that inspired many of his masterpieces. After lunch, spend some time with your Program Director in the provincial town of Vernon. Take a stroll to see the Maison du Temps Jadis (House of Past Times), Vernon’s oldest house, and the 11th-century Church of Notre Dame. Dinner is served aboard. Indulge in leisurely morning cruising along the Seine. You'll spend the afternoon in the medieval city of Rouen, preeminent capital of Normandy. Begin with a walking tour through the center of Old Town, where you see the spectacular Gothic Notre Dame Cathedral, often painted by Claude Monet, and the famous Gros Horloge, a 16th-century astronomical clock. As you walk among the half-timbered storybook buildings, you'll feel transported back through time; see the 14th-century courthouse where Joan of Arc was sentenced to death and the nearby Market Square where she was martyred. Take free time to discover more of Rouen or visit one of its museums of art or antiquities. Dine aboard or at a sidewalk café. Your ship remains docked overnight. After breakfast, begin your full-day tour to the historic beaches of Normandy. Drive past Gold Beach, Courseulles sur Mer and Juno Beach on your way to visit such World War II landmarks as Omaha Beach, the American Military Cemetery and Arromanches Debarkment D-Day Museum. Have dinner and relax aboard your ship or take an evening stroll. Enjoy a leisurely morning cruise to the small town of Les Andelys, known for its imposing castle, Château Gaillard, built in 1196 by Richard the Lionheart. After lunch, join a guided walk to this fatally flawed masterpiece of Middle Ages architecture. Return aboard for scenic cruising and dinner. Late in the evening we dock in Conflans, a riverside town whose unique culture reflects its status as a local hub for barge transportation along the Seine and its tributaries. After breakfast, set out on a walking tour through the charming neighborhoods of Conflans. Or, join an optional tour to the luxurious Palace of Versailles, former home of Louis XIV. Lunch aboard your ship as you sail back to Paris this afternoon. Dine aboard and then enjoy some free time in the "City of Light."